Northern Kenya is an arid part of Kenya, inhabited by the pastoralists who traverse the vast region on seasonal migrations as they seek sufficient pasture and water for their livestock. The harsh weather conditions and the shrinking range resources base has made pastoralists inhabitants of the region go through severe hardships in their survival manoeuvres to protect their lives and that of their livestock from the threats of the drought. This survival manoeuvers has occasionally resulted in conflicts among the communities. The conflicts of late have had numerous casualties, due to proliferation of small arms and weapons from the neighbouring unstable countries like Somalia. Due to the regions marginalization most state institutions are not adequately equipped, staffed or facilitated to handle their respective service delivery to the people. In particular the judiciary is among the least developed state institutions in the region. The courts only exist at district headquarters and are poorly staffed, with cases of one magistrate being shared by two or more districts being common (personal experience). Hence the judiciary has little effect as deterrence to the perpetra-tors of conflict. This study against all this odds facing the Northern Kenya region shows how the indigenous Borana community has alleviated these conflicts over the range resources through their institutions of range resources conflict manage-ment. These institutions which have checks and balances and defined division of roles have been preserved by the community and are active to this day. This is what has made their pastoralism livelihood viable and feasible despite the numerous challenges. The study further demonstrates how the justice regimes of the indigenous community appeals to their socio- political organization and demographic dynamics. Their justice system is restorative and seeks at all times to restore and repair the broken victim, offender and community relationships. 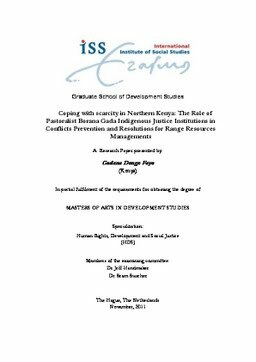 The formal justice systems on the other hand is seen as alien to their value sys-tems and does not take into account how the local pastoralist’s communities understand and define crime and resolve disputes or conflicts. This study demonstrates analytically the socio –political and socio –legal aspects that characterize the customary and formal justice institutions and shows the existence of tension between them that needs to be addressed through a legal framework that accommodates the two in one – legal pluralism. This is to allow the effective operations of customary justice systems without fear of contradicting the formal systems, and to have the customary restorative justice systems decisions of conflict resolutions and range resources manage-ment as binding upon the state.